I shot my last roll of 35mm TMax 400 before Christmas and a roll of Eastman Double-X 5222 just a week or so ago. I'm about halfway through a roll of Adox CHS 100 II and when that's gone, I'm all out of 35mm stock. So it's time to raid the children's piggy bank and buy a roll or ten. The Eastman film was given to me to test by www.ntphotoworks.com but there's no development time available for the Firstcall Superfine brew I've been using for a while now. It's similar to AM74 or Rollei RHS but there's no time anywhere on the internet as far as I can see for 5222 in those developers either. I'll just have to extrapolate by comparing various developers with, say, Tri X, against the same with 5222. A pattern usually emerges and it becomes possible to make an educated guess based on how the development times change with each film. Eastman 5222 seems very popular with some photographers. I was trying to explain its qualities to Cath but was getting nowhere. Then I remembered and told her that the black and white sequence at the start of Casino Royale, our favourite Bond film, was shot on the Eastman film. "There's a black and white sequence at the start of Casino Royale?" she asked in a mystified way. I gave up at that point. The film seems to me to be a little like Tri X with strong tonality, a bit of grain and quite "pushable" - all the way to 6400 ISO - if that's your thing. When it comes to restocking I think I'll just stick with Tmax 400 and the Firstcall developer - although that might change depending on the results from the 5222 roll. Tmax/Firstcall is a very nice and relatively cheap combination. Chopping and changing films and developers is fun and can be interesting but there's nothing like sticking to the same materials for consistent results. One or two films and one developer is definitely the way to go if you want to able to predict the kind of output you'll get from your camera. Mind you, it gives me less to write about on the blog. At our latitude up here in Scotland, a 400ISO film isn't just preferable but well nigh indispensable when it comes to hand-held photography. There are times during the winter when I point my exposure meter out of the living room window at noon and think it must be broken, so low are the light readings. With the Rollei TLR I think it would make sense to uprate Tmax 400 a stop for handheld shooting. The contrast ratio during our dreich days can be so low that I doubt I'd even need to give the film any extra development. 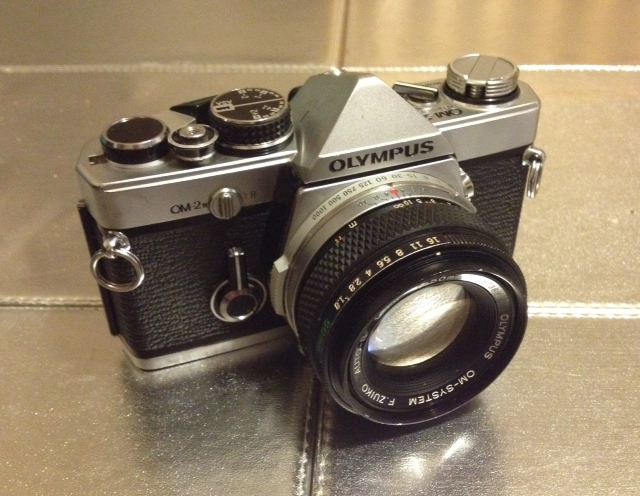 When my film order arrives, I'll be able to try out my latest acquisition - another Olympus OM2. I saw it in a charity shop along with a 50mm f1.8 and T20 flash for £35 before Christmas. I have my my main OM2 and two back-up bodies so resisted the temptation to buy it. However, when I looked in at the shop last week, it was still there with the price reduced to £20. You struggle to get three fish suppers for £20 these days. Well, what's an Olympus user to do? Especially when the sales assistant said I could bring it back if it wasn't working. It turned out that it just needed fresh batteries and new seals. Otherwise, it seems fine with a clear viewfinder and largely blemish-free glass on the standard lens. In fact, it seems smoother in operation than either of my back-up bodies, one of which is decidedly rough feeling. With my main OM2 giving me some concerns, the new camera might be pressed into service earlier than I'd imagined. 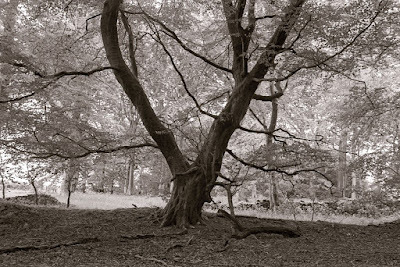 I've used a fair amount of the Eastman Double-X and my favourite developer so far is D76. I started by using HC110 but it felt too contrasty for me. D76 compliments the film very well. I bought a 400ft roll of Double-X and have been manually rolling off chunks and using a bulk film loader to load it into cassettes. So far the furthest I've pushed it to is 500 and it looked nice. There are various examples on my blog. there must be a typo... as you said you won't need extra development time because contrast is too low there, in Scotland. Maybe you wanted to say "less" development... as more the time.. more the contrast.. isn't it? I bought recently an Olympus OM2n and an OM10 with some lenses. The OM10 works flawlessy, while the OM2n has some (very random) light leaks (i.e. 3/4 times in a roll, nothing in another roll, 2 times in another and so on). Plus, the manual mode doesn't worls well, as the shutter times doesn't always seems regular. Have you any suggestion about new light seals? Nice to see you back Bruce! I think bergger brf+ is the same stuff at least according to this http://figitalrevolution.com/?s=bergger+brf. I am not sure if this will greatly enlarge the available info on developing times and developers you will find in the net but it might be useful. I think we're both right. Yes, you can get extra contrast with extended development and you might want that on a low contrast day. Normally, though, if you uprate a film by a stop or more then you extend the development time to make up for what would be slightly lower density on the neg. That's particularly important in contrasty situations but less so in low contrast scenes where there isn't the same extremes between highlights and shadows and you're at lower risk of losing shadow detail. Thanks Petros. I'll check out that link. Can you explain about the Firstcall developer Bruce? Thanks in advance. Your post is timely. I'm about down to the end of my stash of 35mm Tri-x, the re-branded Arista Premium 400 in this case. I surprised myself when I hesitated to order more. Instead, I might get some Delta 100 and hp5+, although there are certainly other stocks I'm considering as well. Earth to Bruce! Hello, Bruce! Where are you, Bruce? Hi Dave. I'm still here - thanks for asking! I'm just very busy doing up the house we moved into at the end of November and there's not much time nor enthusiasm for photography. However, I've figured out a way of stealing some room in the house for a darkroom so things might be set to get moving again. I'll post something in a day or two to update people. Don't think I have been commenting too much on your blog, but just wanted you to know that I've been lurking around reading it for quite a while. It's a great place to linger if there's something you'd like to know about stuff. Tell me about it, getting low on film stock and filling up camera stock instead. I just got my third Nikon F3 the other day, even though I have sweared I don't need more of them. Well... who could possibly say no to that deal, anyway? I was just thinking about what you said about working with few variables. Known film and known developer is usually the safest way to do things for me, anyway. I could also, as a note to self, add knowing that your fix bath is good to go, as I just ruined three good films that way a couple of weeks ago. Keep up the good work, Bruce! You put some really great pictures up here, and interresting stuff to read. I love the 101, it was my first serious camera many (too many !) years ago. It cost me about one month of salary in that time (I guess the '70s). By the way I learned a short time ago the SRT 101 was also the first camera for Annie Leibovitz!